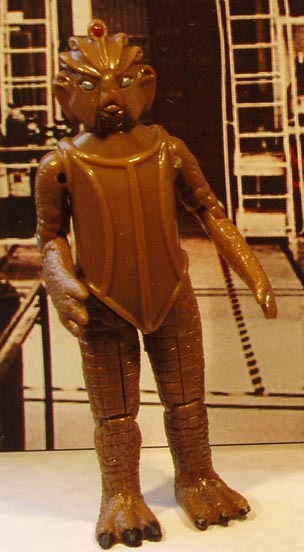 Like most Dapol figures, the Silurian is an odd beast in that it vaguely resembles its TV counterpart. It’s a nice figure with good articulation (shoulders, neck, elbows, Y joint hips and knees) and a nice greeny brown paint job. The head is a little crude- softly representing the shape of a Silurian mask but lacking detail. This is in contrast to the Armoured Silurian released at the same time- There’s something I really like about the Armoured Silurian. It’s basic, it’s plasticy, lacking the paint job of the early Silurian but it looks good. It’s well sculpted and looks clean. The Silurian on the left is from Doctor Who and the Silurians. The one on the right from the 5th Doctor sequel Warriors of the Deep. 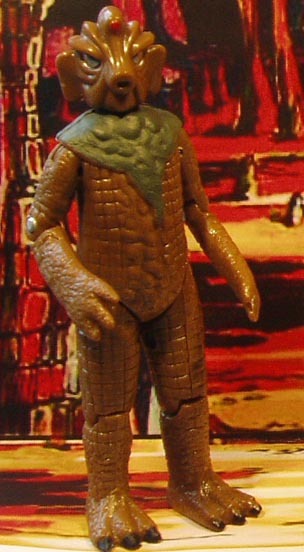 Both Silurians share the same legs and arms with outstretched unusable claws.